Bowiefest is a long-standing tradition in the City bringing the best of Bowie’s civic organizations, entertainers, and businesses to one place for one day. The 2018 Bowiefest celebration will be held on Saturday, June 2nd at Allen Pond Park. It features rides, performances, contests, and a host of food and drink options throughout the park. There's also an Arts and Crafts fair, a Business Expo in the Ice Arena and local organizations of every size and interest will be on hand to introduce you to what they do and perhaps entice you to get involved. 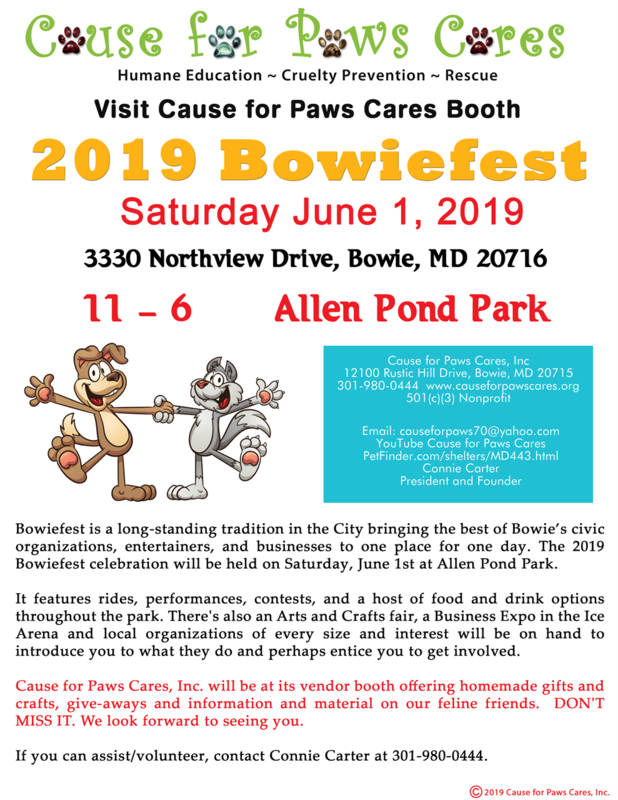 Cause for Paws Cares, Inc. will be at its vendor booth offering homemade gifts and crafts, give-aways and information and material on our feline friends. DON'T MISS IT. We look forward to seeing you. If you can assist/volunteer, contact Connie Carter at 301-980-0444.